Introduction: Stents have been used for quite some time for the treatment of benign and malignant airway stenosis. Silicon stents are preferred for benign situations, whereas metallic self-expanding stents are preferred for malignant comorbidities. Patient and methods: In general, stents can be placed in different approach directions, although in pulmonary medicine it is logical to apply only antegrade techniques – until now. A 63-year-old patient, 168 cm height and 53 kg weight on referral, suffered chronical diseases. The patient was diagnosed with a papillary thyroid carcinoma in 1989, which was treated by resection and radiotherapy. In the following years, she developed a stenosis of the esophagus. 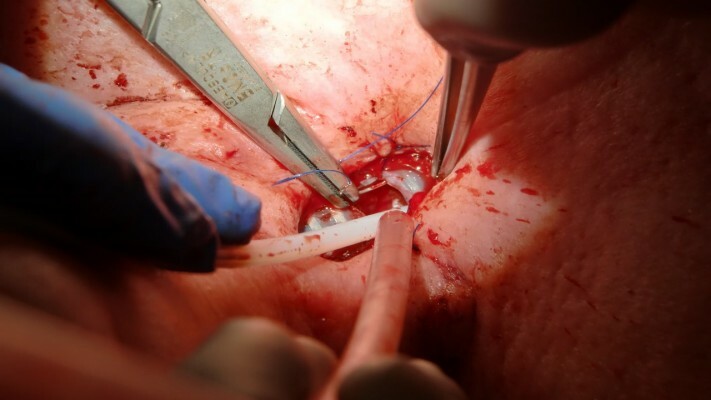 The decision to try endobronchial stenting was made upon the plan to close that fistula with a pedicled omentum majus replacement through the diaphragmal opening of the esophagus. This surgical plastic needed an abutment and a secured continuous airway replacement above the tracheostoma level. A Freitag stent (FS), 11 cm in length (110–25–40) and an inner diameter of 13 mm, was placed successfully retrograde into the trachea and completely bridged the big fistula. Unfortunately the patient passed away due to pulmonary infections after several weeks. Discussion: In this case report, a successful but unusual case of retrograde stent placement of a modified FS is presented.